“The Maoists blew up a cement-laden truck near Kapsi, about 250 km from the state capital, by triggering a landmine, killing three CSEB employees, including the truck’s driver,” a police source in Narayanpur told PTI. RAIPUR: Security forces in Chhattisgarh have been put on high alert to prevent any Naxal attack following a blackout in Bastar region after Naxalities blasted three high tension transmission towers. Intelligence and jail authorities have received inputs that taking advantage of the darkness and communication problems due to power failure in the entire Bastar region, Naxalites could attack some vital installations including jails to take out their associates, officials said on Sunday. Since it would take another ten days to restore the power, the jail headquarters reviewed the situation and directed all the jails of that area to shift the jail inmates, who are accused of being Naxalites, to safer places to prevent any jail break, jail department officials said. As a part of that at least 60 such accused of Dantewada district jail, involved in Naxal related violence, have already been shifted to Jagdalpur Central jail, the officials said. The jail Department had so far identified 182 such people, who had been housed in various jails of Bastar region on charges of involvement in Naxal violence and the authorities have been directed to take permissions from the local court to shift them to safer places, they said. The Maoists had earlier unsuccessfully attacked some jails, including Narayanpur jail, when there was no power in the area and the current blackout could provide them with an opportunity, they said. “All the seven injured have been admitted to Dornapal Hospital in a serious condition,” CPI national executive member Chitta Ranjan Bakshi told PTI from Dantewada. After crossing the Konta area they were passing through Dornapal area when Salwa Judum activists stopped their vehicles, they said. “Initially there was a verbal duel followed by the attack in which at least seven CPI leaders and workers were seriously injured and admitted to Hospital,” they said. Among the injured was one Rama Sodhi, who is an elected Panchayat people’s representatives from Dantewada district, police added. Power supply to five districts of extremism-affected Bastar region of Chhattisgarh was hit after Naxalites blew up three high-tension transmission towers. The Naxalites triggered landmine blasts and damaged three towers of high tension electricity lines in the deep woods of Narayanpur district, Chhattisgarh State Electricity Board officials said. ”Although the damaged area had been identified but it would take at least ten days to restore power supply,” they said. Because of the blasts, power supply to entire Bijapur, Bastar and Dantewada districts and maximum areas of Narayanpur and Kanker districts are affected. The Naxalites damaged the towers in inaccessible and deep jungle area, which do not have roads, because of which the repair work was being hampered. Besides train movement, work in NMDC iron ore mines, located in Dantewada district have adversely been affected. New Delhi – At least four Maoist militants were shot dead on Saturday in armed clashes with police in India’s central Chhattisgarh state, IANS news agency reported. The gun battle broke out in the Sendra forests in the southern Bijapur district when the guerrillas fired at the policemen who were conducting counter-insurgency operations, IANS reported quoting police officials. “The security forces retaliated and gunned down four rebels but several others managed to melt into the forests,” an unnamed police official was quoted as saying. The Bijapur district, which lies over 500 kilometres south of state capital Raipur, is one of the strongholds of the Maoists. The Maoists currently have a presence in 13 of India’s 28 states and seven federally-administered territories. They are most active in Chhattisgarh, eastern Jharkhand and southern Andhra Pradesh states. The Maoists reject parliamentary democracy and aim to capture political power through an armed struggle based on guerrilla warfare. Although the Indian government has intensified operations against the rebels, Maoist-related violence is showing no signs of slowing down. In 2006, 749 people including rebels, security personnel and civilians were killed in Maoist-related violence, while there were over 250 dead in the first four months of 2007. New Delhi, May 29: The Centre today decided to send an official team to Chhattisgarh to review the situation in the wake of the killing of nine security personnel by naxalites in Bastar district. The decision to send a team of senior officials of the Union Home Ministry was taken at a high-level meeting chaired by Home Secretary Madhukar Gupta, official sources said. The team will review the situation, particularly the recent spurt in naxal activities, and discuss the measures to be taken to control the problem, Home Ministry sources said. The latest incident in which Maoists laid booby traps in Kudur village, 435 km from Raipur, killing an Assistant Sub Inspector, a Head Constable and seven constables of the Mardapal Police station of Bastar district. A spokesman said the Home Ministry was in constant touch with the state government and monitoring the situation closely. The Home Secretary, who held a detailed review of the situation with all concerned agencies, had recently written to the state government offering assistance in strengthening the intelligence machinery and a central team had also visited the state to supervise arrangements being worked out to beef up intelligence. In March, 50 security personnel were killed and over a dozen others injured when naxalites opened indiscriminate fire and hurled grenades and petrol bombs at a police base camp in Bijapur district of the state. 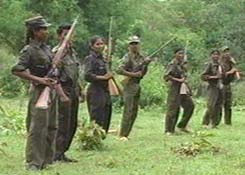 Five naxals were also killed in retaliatory fire.